The village of Walaskema lies in the Wellawaya District of Sri Lanka and is surrounded by agricultural land which until recently did not have a water supply during the barren months of the year. Crops grown include mango, chilli, cassava, onion, peanut, eggplant and gourd. Until 2015, a significant problem lay in trying to water the agricultural land as well. Furthermore, village residents had no water supply for drinking or bathing and their cattle could not survive dry seasons of the year. An additional problem in this village is that of wild elephants who roam in the surrounding jungle and trespass into the village during the hours of darkness, trampling down and eating the crops and frightening the village people. A village resident named Mr Mahinda owns a large area of land and generously agreed to donate a substantial part of this for the construction of a permanent agro well that can pump water throughout the year. 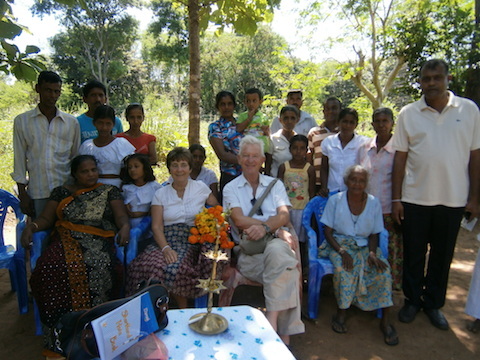 In February 2015 Project Sri Lanka Trustees visited Walaskema and agreed to provide the funding for this well. The completed well, some 25 feet deep serves many purposes including the provision of water for drinking and bathing, the year- long watering of large areas of agricultural land and the provision of a regular water supply for animals. Furthermore, sales of crops enabled by regular water provision enables income generation so that stronger and more efficient fencing can be erected to deal with the encroachment of the elephants. On their return visit to Walaskema in 2018, Trustees were pleased to find that the well had a moderate amount of water in it and was supporting agriculture, despite the very serious drought of recent times. Drinking water is piped from the nearby main road. Crops grown with the well water include peanuts, banana and wood apple. Elephants remain a big problem for this village and the inhabitants are constantly trying to find new ways to protect their crops.